It’s Memorial Day. And I’m blogging about myself. Not sure if that’s what my grandfathers fought for in WWII, or the reason why a generation of new soldiers are slogging it out in Iraq and Afghanistan, but that’s how it is going down this year. When I was a kid I played War with my friends, thinking I could be the next Rambo if I were called to defend my country. Often times, though, someone would have to be the Ruskies or Charlie, and usually I’d be the foreign fighters just so we could get started. I thought, "Well, there’s got to be some reason for the other side to fight, too, right?" Of course, the military of any sensical country would never have me in any fighting capacity. 1) I have a bleeding disorder 2) I have HIV and 3) I possess handsome features which would prove a distraction to both female and male service people. Or maybe I’m lazy because I did an exhaustive interview promoting my book with Deborah Harper at Psychjourney.com. Don’t believe me? You can listen HERE. Or maybe it’s the article I wrote for POZ? 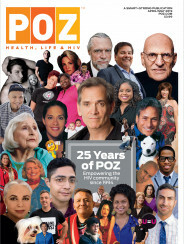 I poured a lot of heart and soul into that, basically a look back on speaking out about HIV in “celebration” of this month, which marks 20 years since my HIV diagnosis. And, thanks again to modern technologies, you can enjoy it with the simple click of your mouse... CLICK! See? Today we can all be just a little bit lazy.